August 26 is National Dog Day, and here’s where Wichitans can celebrate with their furry friends! Fetch Bistro is a dog-themed and dog-friendly café where your pup is always welcome. Fetch Bistro will also host the 1st Annual Fur Festival 5-8 p.m. Thursday, Aug. 31, featuring dog games, contests, prizes, a silent auction and delicious food and drink. All proceeds for this festival go to Beauties & Beasts, Inc., a local rescue working to save dogs from doggie death row. If your pup doesn’t like a crowd, drive through a Freddy’s Frozen Custard & Steakburgers location for a Pup Cup! Chisholm Creek Pet Resort Pup Park is just outside Wichita and requires a membership. The amenities might be worth the price tag for you and your pup, especially if you’re a city-dweller with little yard space. Chisholm Creek has a swimming pond, agility equipment, sand hills and shade trees with plenty of room for a game of fetch. SYLVIA at Roxy’s Downtown shows at 8 p.m. Saturday, Aug. 26. Doors open at 6:30 p.m. for Happy Hour! SYLVIA is a story about a stray dog looking for a new home in Greg and Kate’s recently emptied nest. A.R. Gurney’s SYLVIA is a smart, silly, sophisticated comedy about relationships and growing older. While your furry friend is sure to enjoy the show, dogs can’t go to Roxy’s Downtown. Remember, it’s the thought that counts – and you have a chance to win a SYLVIA gift basket for your dog after the show! What better way to celebrate your favorite canine than with a gift just them? Find a paw-some present at one of these Wichita shops, boutiques and markets! 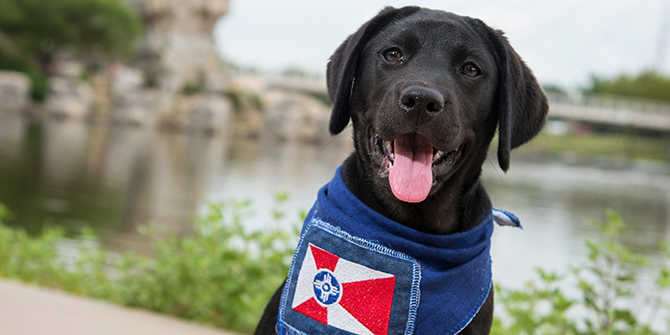 The Workroom sells local art, artisan accessories and Wichita #flagswag – even for dogs! Start your furry friend off right with a ICT Pup Pack, which comes with a dog shirt, some Pup Fresh and Carpet Fresh spray. The Old Town Farmer’s Market runs 7 a.m.-noon Saturdays through October 28 in 2017. Frequent vendors at the market include Happy Tails Pet Bakery and Bubba Dog Bakery, serving up cakes, treats and specialty products perfect for your pooch.